Solid plastic restroom stalls are highly resistant to most common cleaners, moisture, and mildew. They are ideal for many different applications, from the largest public restrooms or stadiums to the smallest 1 stall restroom. This material is also waterproof, and doesn't take much effort to clean. 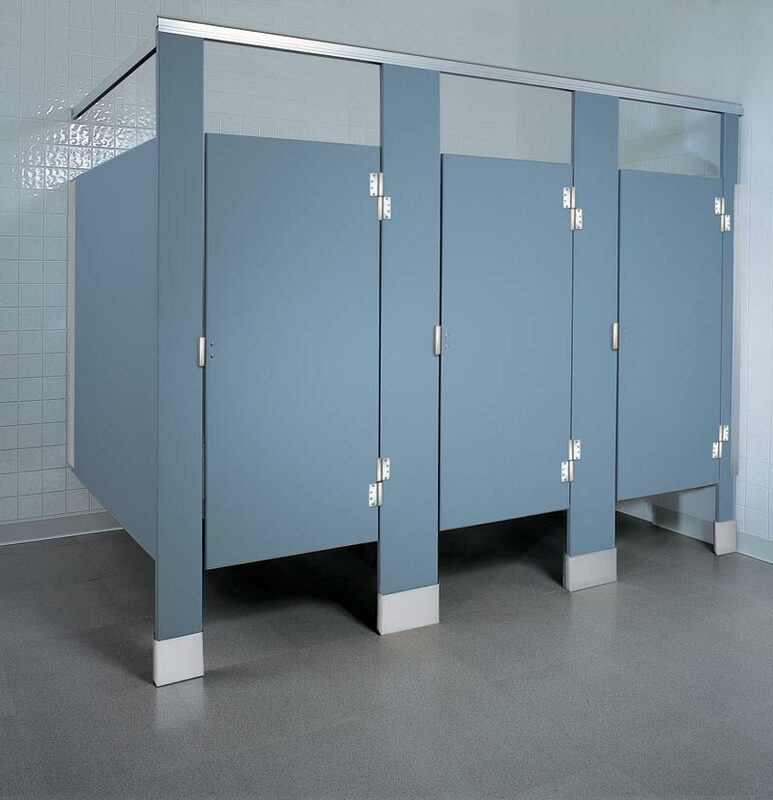 Solid Plastic bathroom stalls are made of 25% recycled materials, and are very durable. This material comes in a large variety of colors, and is able to match with any restroom color scheme. Made from high density polyethylene (or HDPE) resins, these partitions have homogeneous coloring throughout the material and smooth, machined edges. Solid Plastic partitions make a great material choice. An aluminum made heat sink strip is located at the bottom edges of both doors and panels as a standard feature. It's a great place for any high foot traffic buildings, schools, goverment buildings, parks and other public facilities. Solid Plastic is the go to material for when low maintenance and durability are a necessity. It's lightly textured finish hides any effects of vandalism. Solid Plastic is attractive as well as environmentally safe and sanitary. It is completely water resistant and unaffected by steam or high humidity. It has a great resistance to mildew, graffiti and rust. When it does get dirty, commercial cleaning agents are safe to use without damaging the material. Our solid plastic toilet partition options are available in Floor Anchored/Overhead Braced, Floor-to-Ceiling Anchored mounting and Ceiling Hung styles in a wide array of decorating colors options. Many of our most sought after colors also come in 100 percent, completely recyclable options. Make sure to shop around all your different material options when buying bathroom toilet stall dividers. Each material has its own benefits and drawbacks which should be weighed against each other. If you have any questions about your toilet stall divider options, please field them to one of our friendly representatives today.